Why do we choose to use the Twinkle Stars Dance Program for our studio? At INSPIRE Dance Studio we have chosen the Twinkle Stars Dance Program for our emerging little dancers because we know how precious and important those first experiences with dance can be. We want to make sure without a doubt that we are entrusting those special moments to dance educators who best know how to create a happy, fun, stimulating, and educational classroom setting. We’ve chosen Twinkle Stars Dance because it’s rated the number one pre-school dance program in the country, and we wouldn’t want anything less for our little dancers! To keep our little ones fully engaged and smiling Twinkle Star Dance has a set syllabus that is, not only captivating, imaginative, and magical, but also lays the foundation, (by developing the critical motor skills, coordination, balance, and dance vocabulary), for future success as our dancers grow! All classes are a mix of ballet, tap, and jazz. Why choose our studio’s recreational performance program? At INSPIRE Dance Studio we give our recreational dancers the same individual attention and focus on technique and artistry that we give our pre-professional ballet conservatory and dance company students. They work with the same elite professional faculty and are often training in the same classes with the pre professional students. Unlike some studios where the pre-professional students are treated with a higher level of importance, at INSPIRE Dance Studio we make a peer supportive, self-esteem building environment a CORE VALUE. Therefore recreational students will always be treated with the same level of importance, respect, and devotion as any other student. Additionally, unlike many recreational studios where the students are jam-packed into classes of 20-50 students, it is our promise to ALWAYS keep our classes small in size. We feel that is the ONLY way to give each and every student the quality dance education they deserve. It is our goal to give all of our students a fun and inspiring dance experience, while teaching them the self-disciplined habits that will give them the skill set to reach any future dance or life goal! All recreational students are invited to perform in our June Spring Showcase. How our studio’s pre-professional performance programs are a standout! At INSPIRE Dance Studio we offer an unparalleled pre-professional experience! Because we have both an elite advanced ballet conservatory program AND a growing commercial dance team program, students have the ability to focus in on one aspect of the dance industry with precision and diligence OR to cross-train between these programs to become a super star dancer in all aspects of today’s dance industry! Your child’s training is only as good as their teacher’s training, and at INSPIRE Dance Studio we have a team of the most prestigious professional faculty. Not only were they chosen to be a part of our team because of their exceptional professional experience, but also because they teach from a positive, uplifting and inspiring platform. Unlike many pre-professional programs where the environment is belittling, critical, and sometimes even soul crushing, it is our vow to have our teachers bring out the best in our students through detailed, helpful, and positive corrections that will give our students the skill set to grow as top technicians and artists, and the CONFIDENCE to continue to push themselves to reach higher goals. We DO believe that dance is about learning focused and self-disciplined habits, but we emphasize teaching our students to set up healthy self-disciplined habits for the benefit of the results, rather than a fear of being diminished by a teacher or peer. Since at it’s core, dance is about touching souls, we aim to delve deeper than just technical acuity to create young people who value themselves and those around them, and feel safe enough in our dance environment to take that “leap of faith” to truly excel at their highest possible level! Students are accepted into this elite training program by audition or invite only (depending on the semester) and placed in a titled ballet company based on their level and age. Students accepted into this program are given specific core class requirements along with weekly company rehearsals and occasional master classes/workshops. 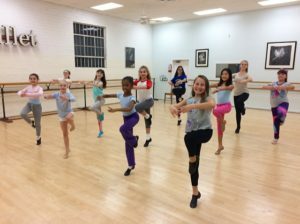 Depending on their ballet level and age students are expected to take between 2-4 ballet classes a week along with 1 modern/contemporary class a week. Our fall semester Ballet Company members (Mini Ballet Co., Pre-Ballet Co., Jr. Ballet Co., and Sr. Ballet Co.) audition for company and perform in our winter Nutcracker. Spring semester Ballet Company members (Jr. Ballet Co. & Sr. Ballet Co.) are invited into the company. They perform at 2 regional competitions, our June Spring Showcase, and potentially at some local events with our Commercial Dance Performance Team. Students interested in taking part in BOTH our advanced ballet conservatory program AND our commercial dance performance team program will be given more personalized core requirements to make participating in both programs manageable. We will base these requirements on their future goals and what we feel they need most to reach a higher level and to excel in both programs! Our commercial dance team program is a budding program at Inspire Dance Studio. As we continue to grow we plan to implement more teams with styles varying from hip-hop, jazz, contemporary, tap and more! (Our Ballet students compete through our Ballet Company Program.) We currently have a competitive Hip-Hop Team for ages 13 and up. Students are accepted into this exciting dance team program by audition only. Students accepted onto the team are given core class requirements in varying styles (typically 3-5 styles) along with weekly company rehearsals and occasional master classes/workshops. Additionally students accepted into this program will perform in two regional competitions a year (driving distance), in our Winter Nutcracker, at our June Spring Showcase, and possibly at local events with our Ballet Company members. Students interested in taking part in BOTH our advanced ballet conservatory program AND our commercial performance dance team program will be given more personalized core requirements to make participating in both programs manageable. We will base these requirements on their future goals and what we feel they need most to reach a higher level and to excel in both programs! Why choose our studio’s musical theatre program? 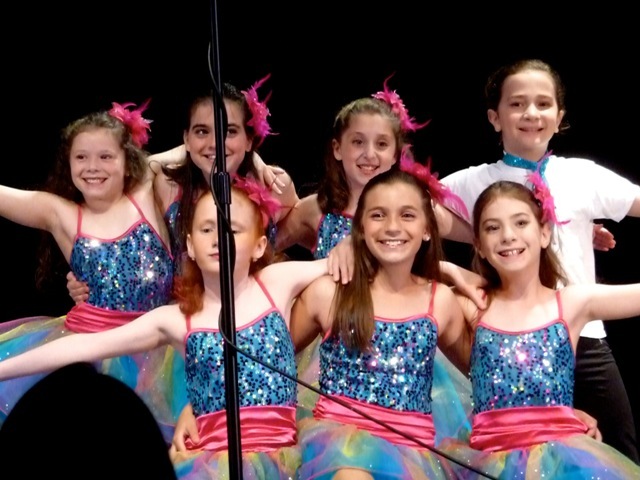 At INSPIRE Dance Studio we offer a super cool, fun, and focused musical theatre program! Unlike some musical theatre programs, we recognize that to truly excel as a musical theatre performer, it’s imperative to be, not only an accomplished singer, but a true “triple threat” with proficiencies in acting and dance, as well. Therefore all of our musical theatre classes offer elements in all three disciplines. Additionally, we encourage our students to have FUN exploring different characters and emotions, and to use their creativity and imaginations; while also offering top-notch vocal technique and theatre dance skills. Our music director, Jennifer D’Onofrio has been teaching with director, Julie Paige, for over a decade in both recreational and pre-professional musical theatre programs. Together they have taught and coached alumni of their programs who are now starring on Broadway, Off-Broadway, and in National Tours as well as Movies and Television! Additionally, alumni from their programs have accepted into such elite college conservatory programs as: The Boston Conservatory of Music, Cincinnati Conservatory of Music, NYU's Tisch School of the Arts, Emerson College, Hart School of Music, Ithaca College, Point Park University, University of Southern California, Syracuse University and more. Whether your child is interested in a musical theatre class for the pure joy of it or with a goal of becoming a professional performer, our studio looks forward to welcoming them and helping them reach their musical theatre dreams!